CAIRO, Oct. 28 (Xinhua) -- Chinese Vice President Wang Qishan agreed with Egyptian leaders to further boost the development cooperation during a two-day visit to the North African country from Friday to Saturday. Egyptian Prime Minister Mostafa Madbouly received Wang at the airport with a welcome ceremony for the Chinese vice president, who made the visit at the invitation of Madbouly. 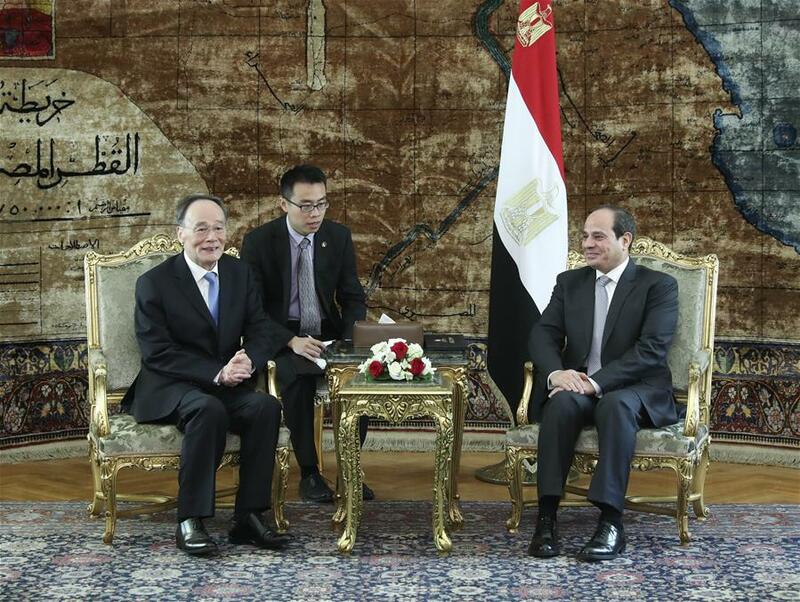 During his two-day visit, Wang met with Egyptian President Abdel-Fattah al-Sisi and Prime Minister Mostafa Madbouly. In his meeting with President Sisi, Wang said that China and Egypt, both ancient civilizations, share extensive interests and great cooperation potential. He said that China is ready to enhance mutual understanding, coordinate the development strategies and strengthen cooperation with Egypt in the fields of economy and trade, production capacity and cultural exchanges within the framework of the Belt and Road Initiative. China is willing to encourage more Chinese companies to invest in Egypt and continue to encourage Chinese tourists to travel to Egypt, Wang said. The Chinese vice president said that China is willing to work together with Egypt, an important country in the Middle East and North Africa, to safeguard the regional peace and stability. Sisi said that Egypt and China, both civilizations with a long history, have enjoyed ties and in-depth cooperation. He expressed admiration for China's development achievements and said Egypt is keen to boost exchanges in governance with China in addition to the dialogue between the two civilizations. Egypt takes it as a priority in its diplomatic affairs to further develop the comprehensive strategic partnership between Egypt and China and is willing to coordinate Egypt's dream of national rejuvenation with the Chinese Dream and seek joint development, said Sisi. Egypt was one of the first countries to give support to the Belt and Road Initiative proposed by China as it believes the initiative will inject fresh and strong vigour in the bilateral cooperation, he said. The Egyptian president said his country is willing to explore possible cooperation involving Egypt, China and other parties in Africa as it assumes the rotating presidency of the African Union in 2019. In the meeting with Prime Minister Madbouly, Wang said that Egypt had been one of the first countries in the Middle East and Africa to establish diplomatic relations with the People's Republic of China and that the bilateral relations had progressed steadily and healthily over more than 60 years. China attaches great importance to the Suez Canal Corridor Development Project proposed by President Sisi and is willing to boost the cooperation with the Egyptian side in this regard, Wang said. China adheres to its strategy of reform and opening-up and the upcoming first China International Import Expo in Shanghai is one of the measures to expand the country's efforts in line with this strategy, Wang said. Egypt can make full use of this opportunity by taking its good enterprises and quality products there and expand its export to China, Wang said, calling for joint efforts to implement the important consensus achieved by the leaders of the two countries and further boost the bilateral cooperation. Madbouly hailed the growth of bilateral cooperation since the establishment of the comprehensive strategic partnership, saying that it has brought substantial benefits to the people of the two countries. Egypt thinks highly of and actively participates in the Belt and Road Initiative and is willing to boost the efforts to coordinate the development strategies of the two sides and boost the pragmatic cooperation, the Egyptian prime minister said. Egypt would like to tap the development experience of China and welcomes Chinese enterprises to participate in Egypt's development, he said. The Egyptian prime minister thanked China for inviting Egypt to participate in the first China International Import Expo as a guest of honor. Egypt will seize the opportunity to facilitate the bilateral economic and trade cooperation and try to achieve substantial results, he said. Wang and Madbouly witnessed the signing of cooperation documents in fields such as agriculture, education and culture.